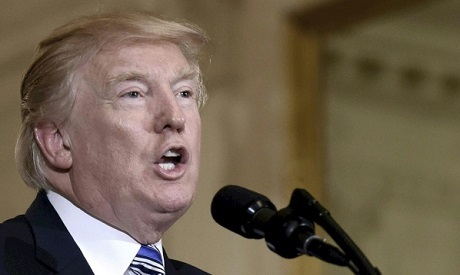 Donald Trump has backed away from a campaign promise to scrap a major nuclear security deal with Iran, with officials announcing the agreement and related sanctions relief will stay in place for now. The Trump administration faced a new congressional deadline Monday to say whether Iran has curbed its nuclear weapons program in line with the accord. Under the terms of the two-year-old agreement, Tehran scaled back production of nuke-making material in return for massive sanctions relief. "The conditions," according to one official who the White House would not name publicly, "have been met, based on information available to the United States." The 2015 agreement rests on a series of technical benchmarks, and was seen in Washington as a way of avoiding military action to prevent Iran from getting a nuke. But it has not relieved tensions between Tehran and Washington, which continue to clash particularly over conflicts in the Middle East like Syria and Yemen, where Iran-backed militias hold clout. On a trip to Sunni-ruled Saudi Arabia in May, Trump called on all nations to "isolate" Shia Iran. During his election campaign Trump denounced the deal -- reached under former president Barack Obama -- and promised to renegotiate it and get tough on Iran. Trump has now twice affirmed Iran's compliance since taking office, effectively keeping the deal in place. But the White House took pains to stress it was not going soft on Iran, pointing to new non-nuclear sanctions and stricter implementation of the deal. An official added: "We do expect that we will be implementing new sanctions that pertain to Iran's ballistic missile program and fast boat program." "Iran remains one of the most dangerous threats to US interests and regional stability," the official said. Iran's Foreign Minister Mohammad Javad Zarif, in New York on Monday to attend a UN forum on development, said he has yet to discuss the nuclear deal with US Secretary of State Rex Tillerson. "There are no communications between myself and Secretary Tillerson," Zarif said at an event at the Council on Foreign Relations. "It doesn't mean there can't be. The possibilities for engagement... have always been open." "We receive contradictory signals," Zarif said when asked about the possible outcome of the review. "It's very clear that Iran is serious about the nuclear deal and we believe the nuclear deal can lay the foundation." The absence of communication is in sharp contrast with Zarif's dealings with former secretary of state John Kerry, with whom he negotiated the agreement. Zarif said that the United Nations nuclear watchdog has certified that Tehran was in compliance with the agreement. Representatives of the five nuclear powers -- China, Russia, France, Britain, the United States -- plus Germany are to meet in Vienna on Friday to take stock of the deal. Zarif said they would discuss Iran's complaints about non-US compliance, accusing the Trump administration of failing to lift sanctions in line with the deal. A steely view of Iran binds Trump's national security team, which at times appear to have little else in common. Many in Trump's cabinet tangled with Iran-backed militias during the US occupation of Iraq. Ex-Marines like Homeland Security Secretary John Kelly and Defense Secretary Jim Mattis also keenly remember Iran-backed Hezbollah's attack on the corps barracks in Lebanon in 1983. Xiyue Wang, a 37-year-old Chinese-American researcher at Princeton University, was recently sentenced to 10 years in Iranian prison. Zarif offered to do "all it takes from my side" to address Wang's case "on humanitarian grounds." But he emphasized Iran's courts were independent. "We in the government do not have any control over the decisions of the judiciary," he said. Trump and Tillerson believe "these Iranian activities severely undermine the intent of the (agreement), which was to contribute to regional and international peace and security," one official said. "As a result the president and the secretary of state and the entire administration judged that Iran is unquestionably in default of the spirit" of the accord, the official added.